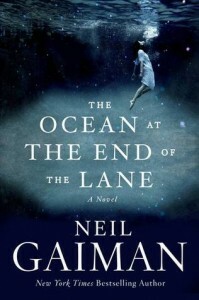 Neil Gaiman’s most recent novel, The Ocean at the End of the Lane, is a study in contrasts. It’s his first book written “for adults” in many years, but the main character is a seven-year-old boy and the writing style is the same clean, spare style he used in The Graveyard Book and Coraline. It’s a novel, but it has the flavor of a short story or a novella, and Gaiman admits in the afterward that he originally thought it was a short story until it took on a life of its own. Then there’s the fact that despite the writing style and length, it took me a month to finish. That last part is my fault, of course, but I digress. The Ocean at the End of the Lane tells the story of an unnamed narrator who returns to the town where he lived as a child for a funeral. To escape from the day, he decides to drive to where his former house used to stand, then he continues his journey on down the lane to the Hempstock farm, where a girl named Lettie Hempstock used to live. He speaks with the old woman still living there and asks if he can see the duck pond out back that Lettie used to call her “ocean”. He sits down to look at the pond and finds himself awash in memories of his childhood, back when he was just a boy and Lettie Hempstock still lived down the lane. The narrator’s life collides with that of the Hempstocks one day when a boarder at his house commits suicide on the border between his house and their property. The narrator becomes friends with Lettie, a girl who seems strangely assured for her age and who also demonstrates powers and abilities that are at odds with her farm-girl appearance. The narrator becomes more and more entwined in the strange world of the Hempstocks as supernatural events begin to escalate and his world becomes far more dangerous. I’ve long said that Gaiman’s Coraline is one of a handful of books I’ve read that genuinely freaked me out. The Ocean at the End of the Lane isn’t exactly the same kind of freaky, but it definitely feels like his darkest and most surreal novel. Gaiman is a skilled writer when it comes to ratcheting up tension and slowly pouring on more and more unreality, but he normally saves his weirdest stuff for his short stories. The Ocean at the End of the Lane is the first time he’s let those sensibilities loose on a larger canvas, and although it did take me a while to finish, he sticks the landing. I was slightly bothered by what felt like the passive nature of the narrator, but it’s easy to forget that he’s only a seven-year-old child during the events he is remembering. He’s as brave as possible and he takes action when he thinks it matters most. Ultimately his heart is in the right place. I’m honestly not sure what slowed me down while I was reading this – in fact, I read an entire book by Lisa Lutz during a break in the middle – but I don’t necessarily hold that against it. Although I was occasionally unsure what I thought of the book, the payoff in the epilogue cemented its status in my mind. I think if you enjoyed this book, you should definitely check out some of Gaiman’s short stories. They’re occasionally hit or miss, but they can also be shivery and intense and beautiful in all the right ways. I particularly recommend Bitter Grounds.